Image Size: 22 X 35 in. In the 1950s and 60s, the worldwide population of peregrines, one of the most widespread birds on earth, plummeted drastically. The word “peregrine” means “the wanderer” and they were once found from coast to coast in North America. DDT laced pesticides nearly brought this raptor to extinction. The falcon disappeared from Yosemite in the late 1940s. Today, this bird of prey is a symbol of a recovering species. In August 1999, the U.S. Fish and Wildlife Service removed the American peregrine falcon from the list of endangered and threatened species, marking one of the most dramatic successes of the Endangered Species Act. In November 2009, the peregrine was removed from California’s endangered species list, 10 years after it was federally delisted. Yosemite National Park represents the highest peregrine falcon nesting density in the Sierra Nevadas and has played a key role in its recovery since peregrines were first re-discovered in Yosemite in 1978, breeding on El Capitan. "In this painting, I have attempted to convey the immense space of Yosemite Valley with Half Dome bathed in the fleeting, golden light of sunset,” Steve Lyman said. “A peregrine falcon, the perfect flying machine, is a master of the air in grace, agility and speed. Its spectacular aerial displays and power dives at prey can at times exceed 200 miles per hour. This one waits, perched on precipitous cliffs, for prey to fly within range of his extraordinarily keen eyesight, ready to launch into the air at any moment." If there was ever a contemporary artist that could capture on canvas the aura of Yosemite National Park, it was Steve Lyman. He was John Muir, the great naturalist, reincarnate. Like Muir, he was most alive and garnered his deepest inspiration while tramping through and about this great natural wonder. 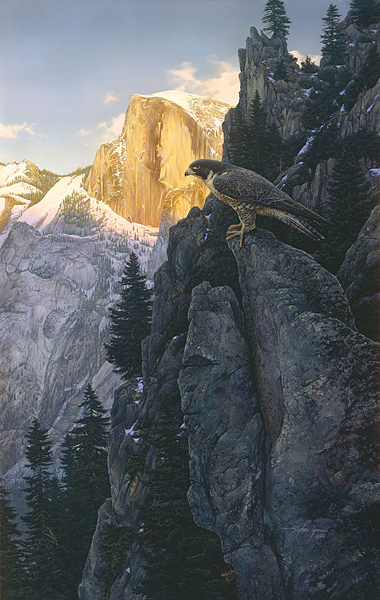 "Return of the Falcon" was created in 1988 to recognize the efforts of all who participated in the peregrine recovery programs in the Yosemite area. This striking Fine Art Edition Giclée canvas captures all the sweeping grandeur as well as the subtle detail of Lyman’s original work. The Greenwich Workshop Anniversary Edition program has introduced to a new generation of collectors the brilliant paintings of this talented naturalist. "Return of the Falcon" is truly a prime example of the wonder and beauty of one of the most important wildlife artists of our time.